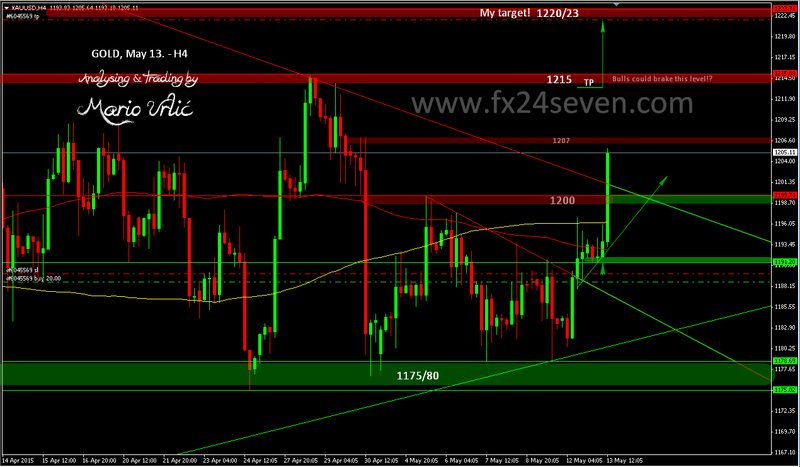 US retail sales data pushed gold true the 1200 resistance and reached 1206 high for now. There is minor resistance here, but bullish momentum could countinue here and higher levels are possible. That’s why I moved my target to the higher level at 1222, but I will watch carefully this 1207 level, 1215 when and if the gold came there and decide what to do with my position. Let’s see could we reach my target today!? If needed, I will stay longer in this position, but support is important now as well if gold returns back. There is Daily MA100 at 1210 and MA200 at 1220, that’s very important as well, but it could be attacked too. Now is getting interesting here, great!